Hawaii tempts you with every kind of shopping – from local surf wear and handcrafts to luxury brands and outlet malls. Drag yourself off the beach and into the air conditioned comfort of Oahu's favourite stores. You won't be disappointed, because shopping in Hawaii is a perfect opportunity to explore the latest northern hemisphere designs from leading USA and European labels, or pick up some of the most exciting factory outlet bargains on the planet. Ala Moana is the world's largest open-air mall, with 310 stores spread across four levels of palm and pool-lined boulevards. Right in the heart of Waikiki, Luxury Row on Kalakaua Ave features designer boutiques like Hugo Boss, Miu Miu, Chanel, Tiffany and Gucci, among others. In hotel lobbies along the seafront, the 'Collections of Waikiki' retailers include Vivienne Westwood and other top-end brands. Ala Moana is the world's largest open-air mall, with 310 stores spread across four levels of palm and pool-lined boulevards. Department stores here include Macy's, Neiman Marcus, Nordstrom and Bloomingdales. On the central stage, you can enjoy cultural performances from local and international entertainers. Also check out Shirokiya's store and food court – it's a replica Japanese town that includes many retailers you'll find only in Hawaii. On the west coast of Oahu, recently opened Ka Makana Alii mall is the perfect place to shop, dine and even stay in the island's fastest-growing community. Famous brands in more than 100 shops include Bath & Body Works, H&M, Macy's, Old Navy and Victoria's Secret. Bargain-hunters should also head west to Waikele's outlet shops. In the 50-plus shops at this open-air centre, you'll find many of the same names as Luxury Row or Ala Moana, but without the upmarket shopping prices. There's a fun, bohemian atmosphere at Haleiwa village on the North Shore. Crowded along the main street, shops housed in century-old styled buildings offer locally-crafted surfboards, bikinis, clothing, jewellery, art and other one-of-a-kind treasures. 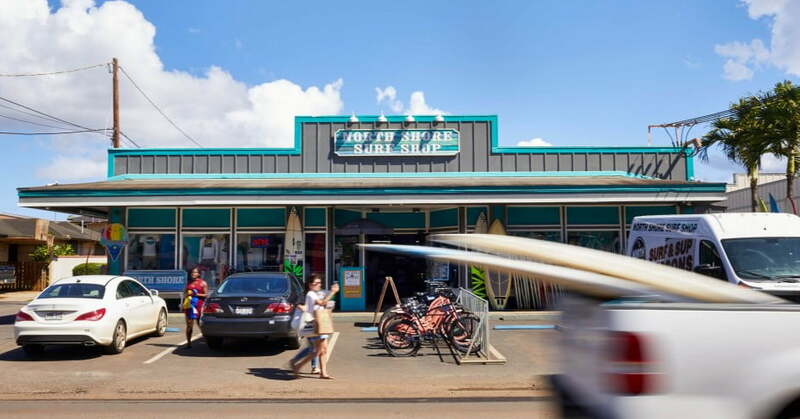 There are three clusters of shops that almost merge together - North Shore Marketplace, Haleiwa Town Centre and the recently refurbished Haleiwa Store Lots.